MYTV Broadcasting Sdn Bhd is lowering its fees for free-to-air (FTA) broadcasters further, say sources, as it races to meet the June 2018 deadline for a national shift towards digital transmission of terrestrial television. 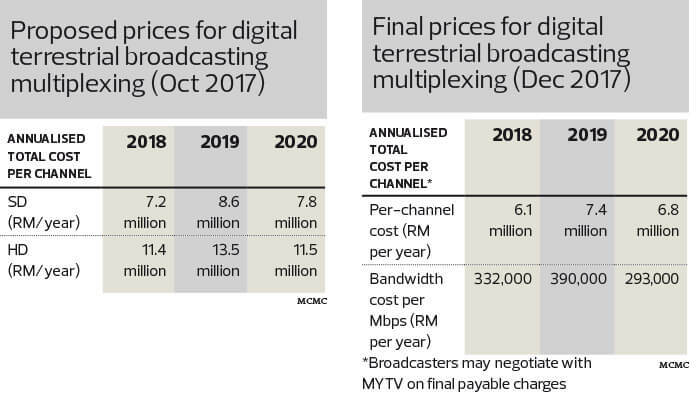 The sources say the latest revision could slash annual fees for a single channel to as low as RM5 million — a third of MYTV’s original proposal of RM15 million per annum for every standard definition (SD) channel. This is the second time the infrastructure and network service provider is cutting transmission charges for FTA broadcasters under the national digital terrestrial television (DTT) rollout. The Edge was unable to contact MYTV CEO Michael Chan for comments. To recap, MYTV had initially sought RM15 million a year for SD channels and RM25 million a year for high-definition (HD) channels. Following criticism from broadcasters, it told The Edge last June that the fees would be reduced to RM8 million and RM18 million respectively. That was on top of a fee waiver until the analogue switch-off (ASO) slated for June this year, Chan had said in an interview last June. After the ASO, all analogue broadcasting in Malaysia will stop. However, a public enquiry by the Malaysian Communications and Multimedia Commission (MCMC) last October led to a fee structure revamp. According to the public enquiry’s findings that were made public last month, FTA broadcaster Media Prima Bhd had said the commission’s proposed regulated prices were steep and higher than what it paid at present. Following feedback, MCMC removed references to SD and HD categories. Instead, it set a ceiling charge of RM6.1 million per channel for this year and RM332,000 in terms of bandwidth per megabits per second (Mbps). The new structure “accommodates the needs of newer broadcasters who may be buying by number of channels or Media Prima who may be interested in buying a multiplex”, said MCMC. In simple terms, a multiplex is when multiple digital signals are combined into one signal for transmission over a shared medium. A decoder then splits the channels for viewing. It is learnt that MYTV is considering the RM5 million price point for single-channel charges, lower than the ceiling price set by MCMC. A final figure could be announced later this month. The latest fee revision comes as MYTV enters a critical stage of the national DTT rollout, both in terms of infrastructure completion and distribution of decoders or set-top boxes (STBs) to 4.2 million BR1M households. The STBs will allow users to receive myFreeview, the national FTA DTT broadcast, which replaces the current analogue television transmission. MYTV will pay for two million units while the rest will be paid for by the federal government. At present, myFreeview carries nine channels — Radio Televisyen Malaysia’s (RTM) TV1, TV2 and TVi; Media Prima Bhd’s TV3, ntv7, 8TV and TV9; TV Alhijrah; and the Bernama News Channel. MYTV had said it was targeting 30 channels by June this year. Sources tell The Edge that of the 4.2 million distribution target by June this year, only 600,000 had been delivered to qualified households so far. The delay was due to MYTV’s search for a new STB supplier as it wanted a decoder that had interactive features, such as viewership data-gathering and internet connectivity. The advanced features will be crucial for MYTV’s financial viability, particularly given the latest fee cuts. In a nutshell, the company is seeking to monetise the STBs’ interactivity for data gathering and audience research on top of other new services. Last week, The Edge Financial Daily reported that Green Packet Bhd was set to bag a RM300 million contract to supply STBs to MYTV. Citing sources, the report said the STBs would likely be sourced from a China-based manufacturer. With a new supplier on board, MYTV will need to cover much ground by June this year with 3.6 million STBs to be distributed by then. It is understood that the company would also seek to replace the 600,000 STBs already distributed with the newer model. The decoders aside, MYTV also needs to complete its infrastructure readiness by ASO. While its target was initially to achieve 98% population coverage, sources indicate that it may seek to ramp that up to hit 100% via satellite connectivity as a temporary measure. MYTV is controlled by Puncak Semangat Sdn Bhd, which won a 15-year concession to develop and operate the national DTT service back in 2014. The concession has since been extended to 30 years, according to MYTV. In November 2016, Telekom Malaysia Bhd signed a 15-year agreement with MYTV to provide DTT infrastructure, network facilities and other services for RM916.1 million. The service period started on Jan 1, 2016. The agreement comes with an extension option for a period to be agreed on by both parties. It is also subject to review every five years with the first review slated for next year, five years after the companies signed the initial framework agreement.